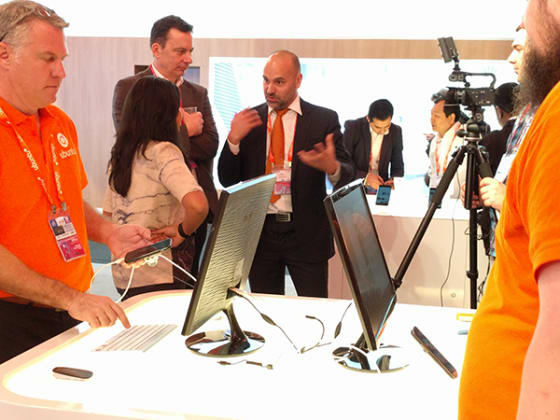 For the whole Canonical team, Mobile World Congress 2016 was a momentous event. Not only were we sitting alongside some of the biggest technology companies in the world in Hall 3, but our big, beautiful stand was the best yet; showing off our latest innovation perfectly. Mobile World Congress was the perfect place to demonstrate together all the different technologies we work on. And there really was something for everyone! We recently launched our fifth Ubuntu device – the Meizu PRO 5 Ubuntu Edition smartphone – and reinvented personal computing with our powerful converged software experience on the new BQ Aquaris M10 Ubuntu tablet. The stand was crammed full of press, enthusiasts and delegates – all excited to get hands on our new kit. Tom’s Hardware awarded the BQ Aquaris M10 Ubuntu Edition Tablet and our converged software experience ‘best surprise of MWC’ for showing a slick software experience on a mid-range device. Trusted Reviews awarded the BQ Aquaris M10 Ubuntu Edition Tablet and our converged software experience Best of MWC 2016 – one of only nine awards given each year for excellence in innovation. Last year it was all about drones and robots, this year we demonstrated how ‘snappy’ Ubuntu Core is gaining traction within a host of industries, and within the semiconductor market. We had six separate demonstrations showing how ‘snappy’ provides an easily updatable, potentially revenue-generating,transactional platform for the creation of apps for a myriad of industries including 3D printing, digital signage and mobile base stations – to name a few. We also showed our mettle in the chipset arena, winning support from semiconductor manufacturers and designers, such as Qualcomm and ARM, all of whom are using Ubuntu Core as part of their ongoing IoT strategies. 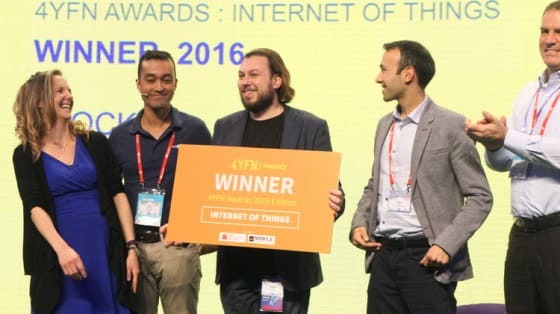 The slock.it solution, running on Qualcomm and Ubuntu Core was an award-winner, too, picking up an award for innovation from 4Y4N (4 Years from Now). We made big announcements, like V-PIL, our VNF Performance and Benchmarking Lab. There’s no better way to objectively compare the performance of one VNF against another. But beyond announcements, we actually showed our progress and real solutions in Software Defined Networking and Network Functions Virtualisation. We had demos of awesome VNF solutions. We showed a software-programmable radio + antenna that we upgraded from 4G to 5G just by switching the VNF hosted in our Ubuntu OpenStack cloud. We had virtual Customer Premise Equipment with entire control plane and functionality hosted in the cloud, as well. PLUMgrid overlay networking showed user-level private domains and how we can put a flat layer 2 on top of any underlay. All of our SDN/NFV demos were running at wire speed. Software and virtual networking functions have arrived. The ability to dynamically deploy an entire 4G or 5G solution, or any over the top service without the redistribution of equipment is an economic game changer. That’s what we showed. Do more with less, and economically benefit from new ways of networking. We’d be remiss to not mention how we do so many cool things in the cloud so quickly. All of the SDN and NFV demos we did were powered by Juju. Juju uses Charms that give applications the intelligence to say, “this is what I need to work, and this is what I can provide to others.” Those two key principles have driven an entire ecosystem of Charm bundles. We can bundle all the Charms for OpenStack into a single deployment – and that’s exactly what we did. We can bundle all the charms for an LTE deployment into a single command, juju deploy , and that’s exactly what we did. Bundles and Charms are user-definable, distributable, and dynamically changeable. Need to change a single VNF to go from 4G to 5G? Change that Charm, redeploy, update the bundle. There’s even a GUI to do it. OpenStack on Ubuntu, plus tools like Juju, are what the modern cloud is meant to be. We showed it off, and people loved it. Loved it. We’re really excited to be running NFV infrastructure for some of the world’s largest telcos. If you want to deploy SDN or NFV infrastructure in minutes, not weeks, ask us about how we did it at MWC 2016. Finally, we all lost our hearts to OP2 who drew huge crowds with undeniable cuteness – check out our video for a look at what we did at this year’s show (and for another glimpse of OP2). If you came to our booth at MWC and want to follow-up on discussion please reach out to our commercial team.